Many simulations made with Aspect can be visualized beautifully to provide insight into the structure of the solution or to illuminate a particular angle of what has been computed. Below are links to a few of these videos. Information about what each of the videos shows can generally be obtained by clicking on the title shown at the top. Also click on the title to get to a place where you can select a larger view. A model of an oceanic plate subducting under a craton, using a highly nonlinear material model. Simulation by Menno Fraters (Utrecht University). Visualization by Wolfgang Bangerth (Colorado State University). For details, click on the video title. 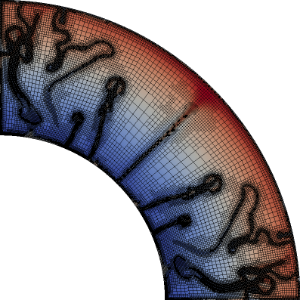 Convection in a spherical shell, simulating convection in the mantle of Mars. The simulation corresponds to roughly the first 750 million years of Mars's history. Simulation by Siqi Zhang (Macquarie University). For details, click on the video title.